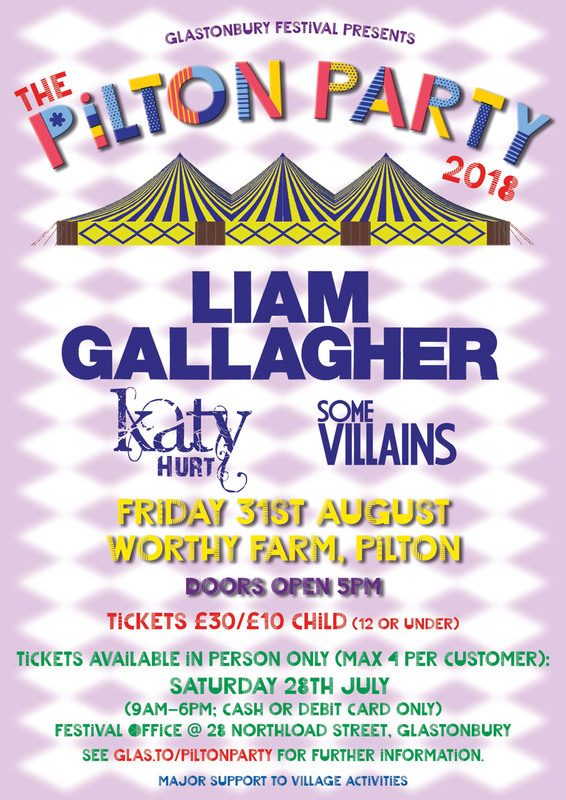 Glastonbury Festival’s annual ‘thank you’ fundraising gig for villagers, workers and local people – billed since the 1990s as the Pilton Party – returns to Worthy Farm on Friday 31st August, 2018. It will be headline by Liam Gallagher, with support from Katy Hurt and Some Villains. Following the in-person ticket sales at the Festival’s Glastonbury town and Worthy Farm offices, tickets for the 2018 Pilton Party are now completely Sold Out. Gates open at 5pm. Live music is due to finish around, with a DJ until midnight. Car parking is free, follow the signs on the A361. 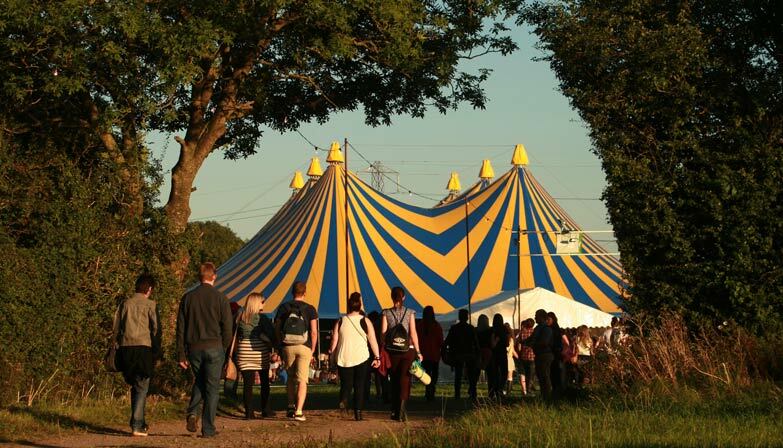 Free shuttle buses will also run back to Shepton and Glastonbury towns after the show. The shuttle buses run from Red Gate car park (from approximately where the bus station is for the Festival). There will be signs from the concrete road which leads up to the car park from the event. There are two designated shuttle routes – Red Gate car park to Shepton, and Red Gate car park to Glastonbury. The buses start at 11.30pm, and the last buses will leave at approx 2.00am, or later if there is enough demand. Please note the shuttle bus only runs at the end of the night and not for bringing people in, and the bus stop will only be staffed from approx 11.00pm. • Admission by ticket only. • Tickets are non-refundable and strictly non-transferable. • The Organisers reserve the right to refuse admission in any circumstances. • No bottles or glass. • Lost, destroyed or stolen tickets cannot be replaced. • The artist and performer line-up and all billed attractions may be subject to change at any time without notice. • Please note: vehicles left in the car park are left at owners’ risk. The Organisers cannot be held responsible for any loss or damage. • All persons who enter do so at their own risk and are responsible for their own safety. • Strictly no dogs/animals allowed on site (except registered guide dogs). • Please use the litter bins and recycling points provided. • Please respect our neighbours and leave quietly to help the event to continue in the future. • Challenge 25 will apply both at the bar and at the gate. • Alcohol will be confiscated from anyone who appears to be under 25 who cannot provide government approved photo ID to verify they are 18 or over. • Children under the age of 16 must be accompanied by a responsible adult. • Please be aware: Excessive exposure to high levels of noise could damage hearing. Please take appropriate precautions. Please click here for full list of Contraband Goods and Prohibited Items.